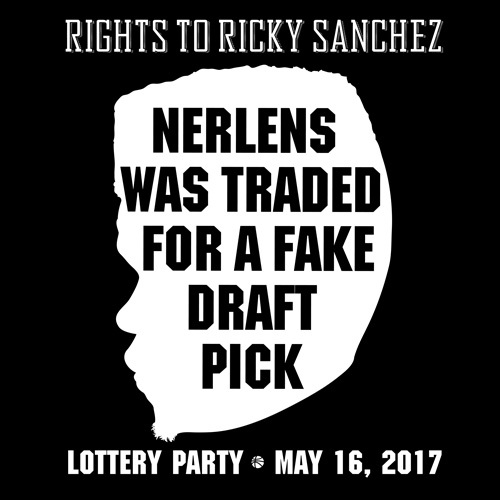 For the first time ever, there are three, that's right, THREE Lottery Party t-shirts available from Cheesesteaktees. The staff over here at The Rights To Ricky Sanchez podcast is donating our proceeds to The Alzheimer's Association of The Delaware Valley and The National Coalition Against Domestic Violence. So you can feel good about buying one. All orders are guaranteed to get to you by the party if you order by May 1st. We're not doing party pick-up this year because the size of the crowd makes it impossible for us to pull off. Ok, that's enough talk, NOW FOR THE SHIRTS! Click on each one to purchase. This one shows the grave of The Process, in an orchard. It's commemorated with the date of the party. This is sort of like if Slayer had Lottery Party shirt. As the description indicates, this is an emo version of the first shirt. It's also got some orange basketballs in the orchard. This is sort of like if Brand New had a Lottery Party shirt.